Decorating is a must for birthday parties. 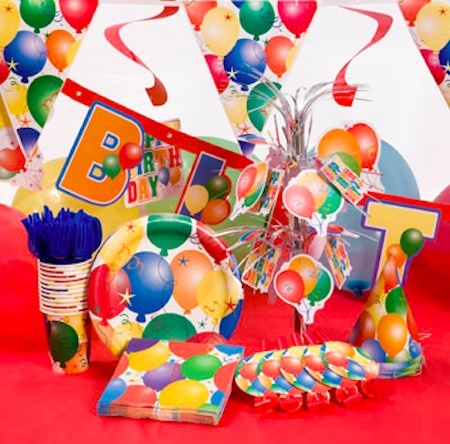 Using discount party supplies is a great way to save money. Putting up streamers and using balloons with matching plates and cups is part of what makes the party fun. When you have plates, napkins and streamers left over, you might tuck them away in a cabinet, never to be used again. Rather than let them go to waste, use them for crafts on a rainy day or when your kids are bored. Here are three ideas to get you started. Using crepe paper streamer rolls is a fun way to use up discount party decorations while getting crafty with the kids. This is a great project for a cloudy day when you have some spare time together. Supplies Needed: A few left-over crepe paper streamer rolls, three high-backed chairs and some tape. 1. Set up three high-backed chairs in a triangle a few feet apart with the seats facing outward. The interior area with be the size of your fort. Use chairs with metal legs that you won’t mind putting tape on to build your fort. Dub them Chair 1, Chair 2 and Chair 3. 2. Get on the inside and start with the back right leg of Chair 1. Secure the end of the streamer with tape on the chair leg very close to the floor. Run the streamer through the space in between the front and back legs, moving across to the bottom of the back left leg so that the streamer is in a straight line that connects the back right leg to the back left leg on Chair 1. Continue across to Chair 2, passing the streamer roll past the right and left back legs. Continue passing the roll around the leg backs to Chair 3, tearing the end and anchoring it on the left back leg of Chair 3. 2. Start again at the right back leg of Chair 1 with a second row above the first. Pass the roll around the back legs of Chairs 2 and 3. Anchor the second row above the first at the back left leg of Chair 3. Repeat the process until the chair legs are covered up to the seat. There will be an opening between Chairs 1 and 3, which is your fort entrance. 3. Start at the back right of Chair 1. Anchor a streamer at the bottom of the seat back just above the seat. Run a streamer across the front of the seat back of Chair 1 and walk around the outside of the chairs, guiding the streamer just above the seat of Chair 2. Continue to Chair 3 and across to Chair 1. Tear it here and anchor the end to the starting point of Chair 1. Start a second row above the first and walk around the outside of the chairs. Keep going. It’s not necessary to anchor the end on every row. Continue wrapping until you reach the top of the seat backs and fasten the last end securely with tape on Chair1. 4. For the roof, run streamers from the top edge of Chair 1 across the middle to the top edge of Chair 2, then from Chair 1 to Chair 3. Connect Chairs 2 and 3 with streamers to cover the open roof space. Crawl into the fort through the entrance. Create your own percussion band with leftover party plates and some dry pasta. Bring out two left-over paper party plates. Let the kids decorate the backs with markers if they are not plastic coated. Put the plates face-side together. Use a piece of tape in two or three places to hold them still. Use a hand hole-punch to make matching holes in the plate all the way around. Pull the plates open momentarily and pour about a half cup of uncooked macaroni onto one plate. Cover it with the other, lining up the holes. Thread the end of a piece of curling ribbon through the holes. If the end is frayed or too soft, form a loop on the end and squeeze it together, then wrap a piece of cellophane tape around the end so that it resembles the end of a shoelace. Line up the plate holes. Lace the ribbon through the holes around the outside and tie the ends together in a knot at the starting point to hold it closed. Curl the hanging ends with a scissor edge. Use napkins left over from your cache of cheap party supplies to create fun folding crafts. The water lily is a simple one. Supplies needed: A large paper party napkin and tape (optional). 1. Start by opening up the napkin all the way into a large square and putting it flat on the table. Draw each corner to meet at the center, flattening the creases and making them even. You will have a square. Take each of these four corners, drawing them in to meet at the center and flattening the creases. Again, you will have a square. Carefully flip it over, laying it flat on the table’s surface. Now draw each of these four corners to the center, flattening the creases. You will have a square. 2. Ask a helper to hold the center with their fingers while you reach underneath. Pull each corner out and up from underneath just a little bit to create four petals. If the napkin isn’t stiff enough to stay in place on its own, anchor the center with a piece of tape. When the kids are bored, making crafts can be a fun and inexpensive way to spend quality time together. It’s also a fun way to use up left-over discount party supplies without spending any extra money. Nikki is an independent writer for DollarTree.com. Dollar Tree offers great deals on office supplies, party supplies and more. I never would have thought of creating a Macaroni Tambourine. Great ideas! Great way to entertain the kids and reuse. I have leftover toy story supplies that need using! These are really interesting ideas. I would have never thought of any of these. Kids would love doing them. Sounds like time to go make more fun memories with my son! Thank you!